The final instalment of PechaKucha for the year saw two presenters from the School of Science, Professor Christopher Austin and Associate Professor Catherine Yule, who are also awardees of the Monash Malaysia Strategic Large Grant fund, talking about life from a genomics perspective and peatlands during the lunchtime talk. 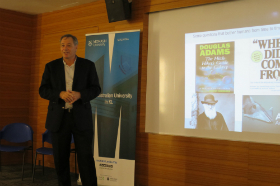 Taking some inspiration from Douglas Adams’ The Hitch Hiker’s Guide to the Galaxy, Prof Austin addressed some important questions about the universe from a genomics viewpoint. “If you like DNA sequences from different species or individuals, then you can see interesting things such as mutations,” Prof Austin said during his presentation titled ‘The Presence of the Past: A Genomics Perspective on the Meaning of Life, the Universe and Everything’. He also shared a few possible answers pertaining to the question ‘What am I?’ from different scientific outlooks. According to Prof Austin, genomics is one of the greatest revolution of our time as through it, we have an unprecedented opportunity to understand life on this planet. Genomics enables the understanding of us as species and as related groups of families. Through greater genetic informations, we can subsequently improve health outcomes at a better rate. 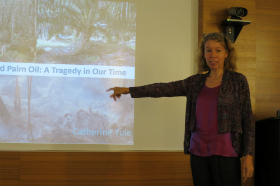 “50 years ago, Malaysia and Indonesia were covered in peat swamps, but now they are covered with millions of hectares of oil palm,” Assoc Prof Yule stated, while explaining that peat is actually made up of organic matter that accumulates in a water-saturated environment over thousands of years. She highlighted some of the values of peat swamp forests such as flood mitigation, water supply, forestry and plant products, and the prevention of saltwater intrusion. 90% of the seasonal haze that affects Southeast Asia is due to burning peatlands, and according to the World Bank Study, Indonesia is the third largest greenhouse gas emitter after USA and China. Changes in microbial communities caused by peat fires will impact the functioning of peatlands with respect to litter decomposition, soil nutrient cycling and greenhouse gas emissions. High methane emissions from peatlands are to be expected following fires. PechaKucha, which means ‘chit chat’ in Japanese, held once a month, is a series of lunchtime talks organised by the Professors Advisory Group (PAG) that feature a certain number of speakers each time. The concise and fast-paced talks introduces the audience to a range of disciplinary areas covered by Monash University Malaysia’s academics.